To see if Endoscopic Discectomy is the right option for your pain condition, call us for a MRI REVIEW. Endoscopic Discectomy is a minimally invasive procedure designed to relieve pain caused by herniated discs pressing on nerve roots. It is performed through a small tubular device with the patient under local anesthesia or mild sedation. Typically, the patient is able to leave the hospital the same day, and risks associated with the use of general anesthesia are avoided. How is Endoscopic Discectomy performed? Once there has been confirmation of a protruding disc, the surgeon will insert an endoscope (small camera) to allow viewing of the herniated disc. Degenerative and extruded portions of the disc nucleus are removed with the use of specialized instruments. 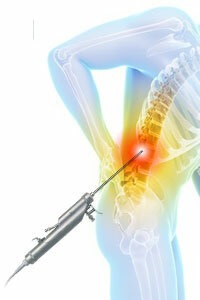 A laser and radiofrequency probe are used to treat the defect in the disc wall. After the procedure, to confirm decompression, an inspection of the foramen and nerves is performed. How is this procedure superior to open surgery? Recovery time is much faster, complications of open surgery are reduced, general anesthesia is avoided, and no muscles or bone is cut during the procedure.